Prepare your quilt to make it the best that it can be! If you'd rather, we can provide these services for an additional fee. Trim all loose threads from the top and the back so no threads show through after quilting. Press all seams completely flat. Press backing fabric to remove all wrinkles. Fold both the top and backing neatly. Trim the selvage from your fabrics before piecing your top and backing. Make sure your quilt top and backing are square. Make sure the top and bottom are parallel. Please make sure the backing fabric is at least EIGHT INCHES larger than the top in width AND length. Please don't use bedsheets for backing your quilts. If your quilt top or backing has a top, please use a safety pin to attach a note and to mark the top. 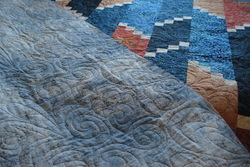 To make flat borders: Before adding the borders, measure the center of your quilt from top to bottom. Don't stretch! Cut your side borders to this length and sew them to the sides of your quilt top, easing the fabric along the seam (use pins to spread the easing evenly). Repeat this process to add the top and bottom borders by measuring the center of your quilt from side to side. Cut the top and bottom borders to this size and sew them to the quilt top, easing, if necessary.